Stephen Davis’ life convinces him a war on truth is being waged and must be resisted. That is now our experience too. Bruce Munro talks to the award-winning investigative journalist about government cover-ups, big business tactics and the role of conspiracies in the Christchurch mosques massacre. On the morning of Friday, March 15, Stephen Davis' concerns about the war on truth were fascinating and compelling, if a little abstract. At 1.40pm, that same day, they became frighteningly real, tragically urgent. Davis is a journalists' journalist. He started as a cadet on the New Zealand Herald, straight out of school. By his mid-40s he was its editor. In between, he worked in London and Los Angeles for The Sunday Times, helped establish the journalist-owned Independent newspaper, and, making a jump to television, was producer for Television New Zealand's current affairs programme Assignment. After five years at the Herald, Davis went back to television current affairs with TV3, then worked for the BBC, taught journalism students in the United Kingdom and headed up a journalism school in Sydney, Australia. In 2017, knocking on 60, Davis and his wife moved to Dunedin. Here, for the past two years, he has been working fulltime on a book that details the war on truth being waged by state, corporate and extremist players. Truthteller: An investigative reporter's journey through the world of truth prevention, fake news and conspiracy theories will officially be launched at the end of this month. Truthteller is written as a toolbox; a grab-bag of techniques employed to suppress, subvert and confuse the real facts. It is entertainingly presented to educate the public and stir people to action. "There is a large and growing number of methods that the rich, the powerful and the elected use to prevent the truth coming out - to bury it, warp it, twist it to suit their purposes,'' Davis says. The world is drowning in mis-information. Many of us are guilty of adding to the problem, he says. Sitting in the lounge of Davis' 1960s, brick "reno'' at the top of St Clair, with expansive views of ocean, beach, city, peninsula, harbour, and listening to him recount adventures and detail his concerns, three things stand out. How soft-spoken and unassuming Davis is, how full and purposeful his career has been, and how strongly he believes seeking or suppressing the truth is the crucial issue of our time. One is left impressed, convinced, but daunted by the task he has taken on; unsure it is worth the gargantuan effort that would be required to roll back the tide. But that was before 1.40pm, Friday, March 15, 2019, when a hate-filled, conspiracy-fuelled attack by a deranged gunman killed 50 people and injured a further 50 individuals at two Christchurch mosques. Then, in a moment, we in distant, safe New Zealand were all made to taste the world Davis knows. Suddenly, the war on truth became frighteningly real; the need to repel that assault, tragically urgent. I had interviewed Davis before the events of March 15, but it was obvious following the tragedies of that day that a second conversation was necessary. This week, our national psyche awash with anger, grief and soul-searching, Davis answered more questions, specifically about the role conspiracy theories had played in the mind of the man who had temporarily lived among us, trained for and then carried out this horrific, baseless act of terrorism on our soil. THE shooter demonstrates the power of conspiracy theories and the damage they can do when they are amplified by social media, Davis says. He had chosen to believe stories widely disseminated on the internet but with no more basis in fact than childhood fairy tales. They included a conspiracy theory that, if believed, could undermine vital international humanitarian work. That particular conspiracy theory has popped up in different forms to support different agendas, Davis says. "You'll find another form of it used by dictators. Putin, for instance ... or Erdogan. Conspiracy theories are used to invent wished-for "truths''. They are also used to hide the truth, Davis says. In Truthteller, he details his investigation of the 1994 sinking of the ferry Estonia in the Baltic Sea, with the loss of 852 lives. It seems likely Western allies were using the passenger ferry to smuggle Russian space and missile components and data to the West, that the Russians discovered what was happening and detonated a mine that had been placed on the ferry. After the news of the sinking broke, wild conspiracies emerged from Russia. One claimed the Russian-Estonian mafia had used a miniature submarine to mine the ferry as a warning to pay protection money. Another said Arab terrorists sank the ferry at the behest of Russian intelligence. A third said there were stolen Russian space laser systems on board. It had all the hallmarks of classic Russian intelligence dezinformatsiya (disinformation), Davis says. "This is fake news in the real sense of the term - designed to deceive or to distract people from the real story. A similar wildfire of contradictory conspiracies spread after last week's tragedy. "Within 48 hours of this shooting, there were a couple of wild conspiracy theories circulating freely on the internet,'' Davis says. One said the shooting was a "false flag operation''; planned by one group to make another look bad. With gritted teeth, Davis has been following the postings of a particularly notorious American-based conspiracy theory group that has followers all over the world, including in New Zealand. It has embraced two contradictory false flag conspiracy theories about the shooting. What is extremely concerning, Davis says, is that conspiracy theories are increasingly making their way into mainstream right-wing discourse. Some conspiracy theory rhetoric has even been echoed by the President of the United States. Davis says conspiracy theories might sound laughable, but "actually [they are] not''. "A lot of people like to share and engage in conspiracy theories because they think they are entertaining or interesting, which on some level they are. A feature of the information shared in these online groups is that there is always a call to action. DAVIS has no trouble reconciling his willingness to talk about the details of conspiracy theories with his warning that spreading such stories can help radicalise lonely, alienated individuals. To write about terrorism, to understand it and why people become terrorists, we have to deal with some of the thoughts and ideas that are motivating their actions, he says. Davis draws a comparison between how we now treat suicide and how we talk about terrorism. When working for TVNZ during the 1990s, he produced a current affairs show on teenage suicide. At the time, the thinking was that media should not report on suicide for fear of copycat acts. He faced a lot of opposition, except from the parents who strongly supported talking about what had happened to their children. The approach now is to talk about suicide, albeit carefully. "Time has shown that all those years of trying not to talk about it didn't get us anywhere. He quotes a piece by Asne Seierstad that appeared this week in the New York Times. Seierstad has studied the perpetrator of the 2011 mass shooting in Norway. "Are we complicit in spreading the ideas of these fascists by writing about them? The answer is no,'' Seierstad wrote. "We can't allow ourselves to be ignorant. To fight terrorism, we need to research how individuals become terrorists. We need to analyse and expose fascist thoughts and violence. There has been a concerted effort in the West to examine the ideology of Islamist extremists. Studies have shown that offering a different interpretation of facts and a different call to action to people who have been radicalised can have some success. The same thing has to happen with the ideology of right-wing, white supremacists, Davis says. Conspiracy theories are just one way a war is being waged on truth, Davis says. Drawing on experiences spanning a 40-plus-year career in journalism, both personal and observed, he identifies, in his book, 10 truth-suppressing tactics that he wants the public to wake up to. "For democracy to function, there needs to be a free flow of facts,'' he says. Davis tells of his attempts to find out who murdered a 21-year-old Australian rental car company employee. He details how delaying tactics mean that, 24 years later, no-one has been convicted, despite a murder confession. He tells of a spy dubiously sacked by his country's intelligence service who is denied a right of appeal and then, when he tries to write a book about his experiences, is hounded around the world and subject to prolonged character assassination. The intelligence service is not held accountable. The whistleblower is silenced. Shooting the messenger is another way to silence the truth, Davis says. 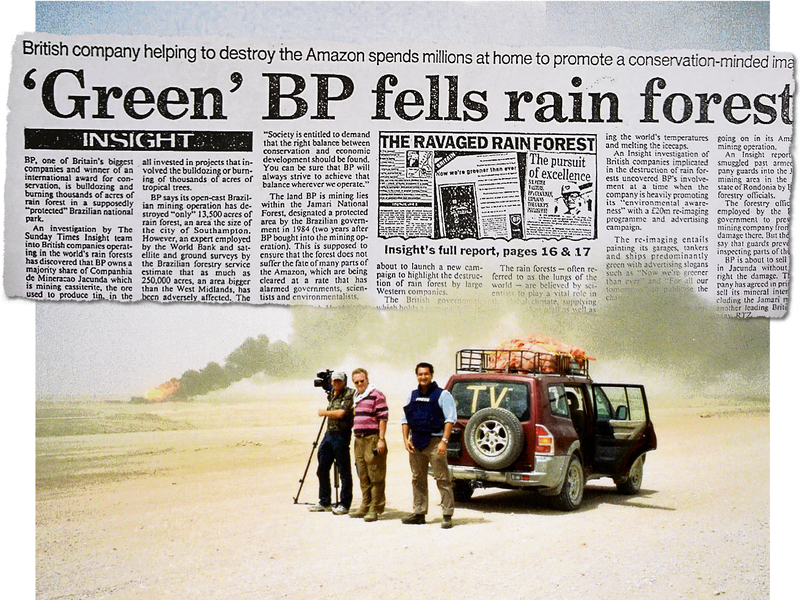 In the late-1980s, he was sent to Brazil by The Sunday Times to hunt for a rumoured BP-owned mine damaging Amazon rainforest. He found the mine and wide-scale environmental damage, which was reported despite attempts to stop it. Two months after the story was published, however, Davis discovered government officials, instead of investigating the mining company, threatened those who helped him get the story. "It is one of the most popular truth-suppression tactics, deployed many times in many countries. The ultimate truth prevention tool is supercharged by digital technology, Davis says. Create your own reality and get millions of people to believe you. Not long after Donald Trump was elected President of the United States, private text messages between two FBI employees not enamoured with their new leader were intercepted. "Are you even going to give out your calendars? Seems kind of depressing. Maybe it should just be the first meeting of the secret society,'' one message read. The text seemed to confirm what some Republicans had suspected; there was a group in the FBI that were out to get Trump. This suited the President and his supporters. He was in a tight corner over the FBI investigation into accusations of collusion with the Russians in the run-up to his election. The story of the "secret society'' was picked up by Fox News and other media supporting Trump. They ran with, and embellished, the unsubstantiated story. "Get yourself quoted on friendly media and ... then get other friendly media to quote them,'' Davis says, explaining the strategy. "Then you quote the friendly media in support of the story, and then the story spreads on the internet. "You refer to the story and how it is spreading ... as evidence that it is true. Davis believes all these anti-truth tactics, from conspiracy theories and delaying tactics to intimidation and "alternative facts'', need to be exposed. They are eroding trust in democratic institutions and need to be confronted. It would help if internet platforms were treated as publishers, held to account for what they allow online, he says. "Facebook is now one of the most grotesquely irresponsible organisations imaginable. What is sorely needed is an information literate population; people who are intelligent consumers of information, who understand the difference between fact and opinion, who know that gossip is just that, who ask more questions before making up their minds and are prudent about what information they share. Even as his book hits shelves, Davis already has several other irons in the fire. He is developing a website, understandthemedia.com; a series of lectures with the University of Otago; and, a primary school-aged curriculum with Australia's Walkley Foundation for Journalism. "If, before I die, information literacy courses of this kind are regularly taught, I'll be a happy man. For all our sakes, after March 15, he certainly hopes so. Stephen Davis will discuss his book Truthteller with Guyon Espiner at the Dunedin Writers & Readers Festival. The War on Truth, Saturday, May 11, 5.30pm at the Dunedin Public Art Gallery. So I presume Mr Davis would be FOR open access to the so called "manifesto"? What's near all over/ Cryptic, or telegraphed messages, are a sign of disinformation.